What are your earliest cricket memories? Playing on the outfield at the Chepauk Stadium in Madras with my brothers. And then it was club cricket for Clayhall and nets at the Ilford Cricket School. Cricket was in the blood, really [Hussain's father Joe played once for Madras] rather than something I chose to do. There was no other option and it was a good way of getting out of the house. How did you come to bowl legspin? It came very naturally. I was quite small and I used to toss the ball up. Then one winter I shot up in height and suddenly everything - like the trajectory and angle of delivery - changed. It just went, it was quite horrible. I got the yips, basically. When did the batting take over? It was an Essex schools trip to Barbados, where I got my first hundred. I hadn't been a frontline batsman and I was a more natural see-ball-hit-ball, wristy, Asian-type player. The closer I got to Essex 2nds, the more technical I got with my batting. So you changed your game? I didn't consciously change. It's just that the higher up you go, the tighter your game needs to be, or so I thought. Some would argue the opposite: that with better pitches you should be able to express yourself, a bit like Kevin Pietersen does. Looking back, I wish I had been a bit more like that. But I always had a fear of failure, a fear of getting out, so I tried to eliminate risk from my game. If it meant getting a boring hundred rather than a dashing fifty I'd take the boring hundred. It didn't make me a very pleasing player on the eye by the end. Was your first England call-up in 1989 a surprise? It all came very quickly. I was just having a laugh at Durham University and playing for Essex in the summer holidays. Then suddenly at Leicester, Goochie tapped me on the shoulder and said: "You'll be coming with us to the Nehru Cup [one-day tournament in India] and then the West Indies." In the Nehru Cup I carried the drinks and brought out gloves for Robin Smith every two minutes. Then I found myself playing in the semi-final, against Pakistan, trying to work out which way Abdul Qadir was spinning it. I got about one off 10 balls and was lbw trying to cut his flipper. I walked off thinking, "Thank God that's over". After three Tests then in the West Indies how come you had to wait three years for your next Test? I broke my wrist in the West Indies and there were a lot of good players in front of me, so I couldn't complain. I had good and bad seasons for Essex. I was a real form player: if I got on a run, I was happy and confident, but if I had a bad trot, I was far too analytical of my game, worried about it too much and my form got worse. It was a breakthrough innings. I'd been asked to bat No. 3, which I thought might have been a bit high, but I got a hundred, which showed me I could not only bat at Test level but also bat three. I had some luck: Darrell Hair gave me not out when I gloved Srinath down the leg side. The innings allowed me to relax and just bat. In those days there were a lot of external pressures - TCCB hierarchy, selectors, the media - that influenced selection. However good Athers [Mike Atherton, the captain] or Bumble [David Lloyd, the coach] were to you, you'd be left out after two or three bad games. You always felt you needed a score to give you that breathing space. 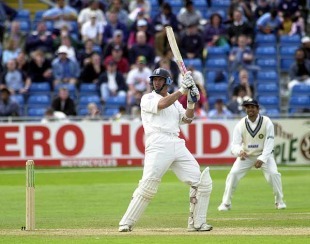 How satisfying was your double-hundred against Australia in 1997? That was how I wanted to bat. I had been struggling for Essex but once I'd hit a couple of boundaries I was off. That was certainly not a boring innings. Stewy [Alec Stewart] said he'd never seen me bat like that, and I always remind Benedict [Sky Sports' statistician] when I'm getting stick in the commentary box that it's the most boundaries by an Englishman  against Australia. This was against Warne, McGrath and Gillespie. Mark Waugh was standing at slip. These were great names in cricket that I wanted to impress. I took a tape of that innings everywhere after that. That was the best I could bat. If I was in a poor trot, I would watch the tape. That was my benchmark. It didn't happen very often like that afterwards, but that was what I could achieve. How much of a surprise was it to become England captain in 1999? Is that your way of saying I was a bit of a rebel? I think they'd run out of options. Myself and Ramps were the two interviewed. No one had mentioned me as captaincy material but I had done an England A tour to Pakistan pretty well. I was fortunate because good things happened behind the scenes with central contracts coming in. Lord MacLaurin [ECB chairman] did a good job. "A few people were suggesting a complete clear-out, getting rid of everybody, including our best players, like Atherton and Thorpe. There was also a desire to get rid of difficult players, but I wanted guys like Caddick and Tufnell around. You can't have 11 yes-men. I understood Caddick, for example, had a fear of failure, as I did too"
You lost to New Zealand in your first series and were booed at The Oval. How difficult was all that? It was chaos. I broke my finger early on and left Thorpey [Graham Thorpe] in charge, when the selectors wanted Butch [Mark Butcher]. 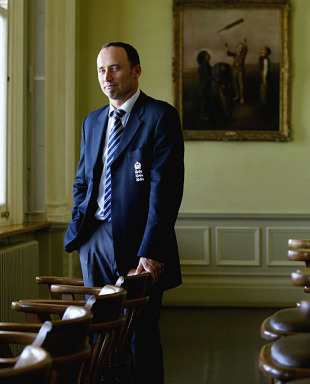 There were meetings behind the scenes with current and former selectors, MacLaurin… Botham was coming in as well. It was chaos. A few people were suggesting a complete clear-out, getting rid of everybody, including our best players, like Atherton and Thorpe. There was also a desire to get rid of difficult players, but I wanted guys like Caddick and Tufnell around. You can't have 11 yes-men. I understood Caddick, for example, had a fear of failure, as I did too. How important was your relationship with Duncan Fletcher? All credit to the ECB. They got it right. I thought they'd go for Bob Woolmer. We were both left-field selections - he'd heard some dodgy things about me and I didn't really know who he was. We met at Lord's and we liked each other. He found the rumours about me had been exaggerated and I found a very calm, businesslike person. He was almost a "non-cricketer", which I liked because I had always felt that English cricket was too much "jobs for the boys". He was an outsider and we were going to get a different opinion on English cricket. I remember him asking me how come England could be so bad with the players we had. It wasn't through lack of personnel, it was through structure, management and selection. We were going round in circles. We brought a lot more consistency. Central contracts were a massive thing. They made players think of England as their team. How did the team's fortunes change? We created a team. We went to the subcontinent in 2000-01, which really helped because there's not much to do socially there. We created a unity by ensuring that all our rooms were on the same corridor of the hotels. We'd leave doors open, there'd be PlayStation sessions and quiz nights, a lot of banter. People worked hard in the gym. That winter was one of my favourite periods. Winning in Pakistan and Sri Lanka were two very special efforts. Fletcher was really starting to take over at this point. He viewed each new selection as an investment. He wasn't interested in the next one or two games, he wanted to look further down the line. There was a lot of trial and error. We maybe had to pick six or seven players to find two good ones. From a technical perspective he wouldn't just tell you that you had a problem, say, against the spinners; he would show you how to fix it. For the first time we were formulating plans about how to get batsmen out and the bowling attack to do it. How do you reflect on the 2003 World Cup and the Zimbabwe crisis? It was a lose-lose situation. Whether to play in Zimbabwe was a very important issue and one that, as a team, we had to consider. We fudged it [England forfeited their game in Harare] and probably wish we could have done it like Andy Flower and Henry Olonga [who made a black-armband protest] but it wasn't our place to go into another country and make a political statement. I felt we should have stayed out and made a political statement that way. Basically I didn't want to go to Zimbabwe and play cricket, and a lot of our team didn't. So we didn't. We fudged it but we didn't. And then you resigned the one-day captaincy. I wasn't a great one-day player and I'd probably outstayed my welcome. I knew then it was the beginning of the end. Fletcher and I debated long and hard about whether Vaughan or Trescothick should replace me. We'd been so loyal to Tres and he'd been very loyal to us but I had a gut feeling that he was a very good vice-captain but not a captain. I thought Vaughan was a calm, class act. At that point we hadn't seen anything tactical from him. He was a typical Yorkshire opening batsman, keeping himself to himself at mid-off. But we knew that in terms of doing the job on and off the field, he was the man. It was hard on Tres, but we just had a gut feeling. Why did you resign the Test captaincy later in 2003? Vaughan had done the one-dayers so well that I asked Fletch whether he should just carry on and do the Tests. I suspect that Fletcher thought he should but was concerned about him starting against South Africa. I read an interview with Jimmy Anderson about how much he had enjoyed playing under Vaughan, and when I turned up at Edgbaston for the first Test against South Africa it just didn't feel right. The side had "gone" a bit. The game didn't go well. I felt under immense pressure. I was feeling the heat as a player and my brain was completely scrambled. I sat down with Duncan and told him I'd had enough. I was a spur-of-the-moment kind of bloke. Strauss had come in and scored a hundred; I was a bit worried I might be dropped. I spoke to Duncan the night before the final day and said, "Tomorrow's my last day." He sort of agreed. I suppose I cleared my brain and started to enjoy it again. It was a good pitch and New Zealand didn't have a great bowling attack. It was a comfortable hundred and it ticked all the boxes. It was too good an opportunity to pass up: scoring a hundred at Lord's… hitting the winning runs… having Thorpe at the other end… and having a glass of champagne with Fletcher on the balcony. Yes, I'd have liked to have played 100 Tests, but basically I was done with the game. I played 96 Tests, which is probably more than I should have, with the amount of ability I had. Are there any regrets? Does not winning the Ashes rankle at all? There are odd games, like the India one-dayer at Lord's in 2002, when I think, "Crikey, how did we lose that?" Whenever I go to Port Elizabeth all I see is Andy Bichel smashing us out of the World Cup. When I see people like Pietersen bat, I wish that I'd freed up a bit as a batsman, but it's very easy to say now. I don't worry about the Ashes so much because we weren't as good as Australia. It's as simple as that. A lot is made about mental toughness but it's just that they were better. John Stern is editor of the Wisden Cricketer, in the April 2010 issue of which this article was first published. Subscribe here.